Salome was one of the women who stayed with Jesus at the cross, and later witnessed the empty tomb. Do me a favour, she asks, not specifying. Jesus smartly does not say Yes, but what do you want? The human quest for fame, attention, significance, importance, power and approval is played out here in this little family tableau. Not a yes, not a no. A perhaps. They have passed the same hurdle. But they must submit to the Father’s will just as Jesus does. 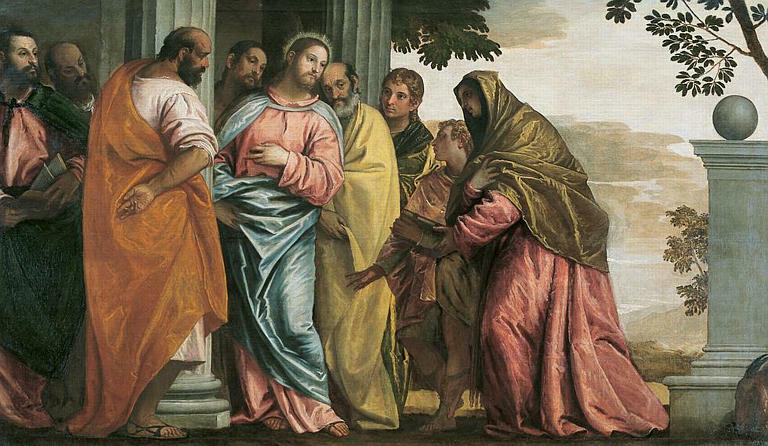 They felt that James and John preempted them in asking for what all of them also wanted–and manipulated Jesus by bringing their mother into it. Greatness comes in God’s eyes comes from serving. Those who can serve others will be great in the eyes of God. And the one who serves the most is the greatest in God’s eyes. Lord, open my eyes to opportunities for service at home, first and foremost. Just as Christ came to serve many, and to offer his life in their stead. Christ paid the ransom of his own life to free us from the slavery to sin, and to release the Holy Spirit to help us lead better lives. A servant was a hired worker, and a slave, one forced into service. These were two of the lowest position in Jewish society, yet Jesus says that true greatness in his kingdom belongs to those who can serve others. This is a challenging statement for me, Lord, and I am far from understanding or living it. Lord, have mercy. And when the King, the Lord of glory, came to dwell among us, who was counted worthy to follow him, to be the first Christians? * he who, with the insight God lavishes on the unworthy, early recognized the Messiah, dominant, cocksure Peter of erratic insight, whom Jesus fiercely rebuked when he recoiled at his friend becoming a paradoxical suffering King whose magic kingdom was not of this world, who was draped in royal robes with mockery and great laughter, whose crown was of thorns, whose throne was the cross, and whose insignia was his nail-scarred hands. * those who were fiercely competitive in the noble enterprise of establishing the kingdom of whose nature they were uncertain; always enviously trying to identify the favorite, the greatest. * Those who continually forgot his vivid miracles, and were continually rebuked for their lack of faith. But though they disapproved of his approach to money, power, or people, they loved him. “Let us also go that we may die with him,” Thomas says, though in the hour of terror, not one of them dared to, not yet. To these men he walked up, looked into their eyes, and said, “Follow me,” and they rose, leaving nets and tax booth, and walked behind him–becoming, by that act, Christians. And he comes up to us, people indubitably in process, amid the muck and misery and marvel of life, looks at us, and says, “Come, follow me.” And as, with an ardent, “Oh yes!” we make our first changes, we become Christians. And are we, by those words, instantly transformed, utterly transfigured? No more than they were, though they were with him all day, all night, loving him despite their ambition, pride, doubt, and impatience. The long years it takes to become a writer, a mathematician, but in the wideness of God’s mercy, all it takes to bear the tremendous badge of a Christian is our “yes,” our tottering steps. And though we may trip and stumble and stray, he steadies us, and leads us on, transforming us by the slow-release seed of his life within us, as potent and generative as that seed too small to be seen by the naked eye, shed in an ecstatic night we cannot identify, that made the children we adore. In moments of total surrender and loving trust, I have decided to follow Jesus 100%. And between commitments, how much has my commitment actually grown? A percentage point, perhaps more, if it was a major renunciation. How disastrous in the world’s eyes! I see these cruel graphs in stores–Employee goals: a minimum of a hundred percent efficiency and I think of the ones he chose: Peter who declared, “I will go to the death with you” and believed it too, but who, in the darkness, by a coal fire, in a chiaroscuro scene that Rembrandt and Caravaggio loved, “never knew” the Jesus being degraded by his enemies–but whose bitter tears led to a bitter-sweet reconciliation at dawn, by another coal fire. The Lord of Glory accepts us just as we are, even as he molds us into what he (and between gasps, we) wants us to be. I read of Francis Schaeffer’s “plant-throwing, pot-smashing temper” in a profile in Christianity Today. And he was one of the most influential Christians of the twentieth century. Had he crossed over into Christ’s magic Kingdom? I don’t doubt it–for that is the magic of the Magic Kingdom. It deigns to reign in jars of clay. In his son Franky Schaeffer’s autobiographical novel, Portofino, the evangelical leader growls dangerously, “Elsa, I wish you wouldn’t interrupt my quiet time with the Lord.” “You’ve just had your quiet time, and you are still so irritable with me,” my husband observes plaintively. I have made similar observations of his spiritual life, less temperately. In the early years of our marriage, we knew the wild fire of sin when our inherited tempers were activated and the air was alive with identified flying objects–a camera, a vase–yes, still nonfiction, unfortunately, and the next morning the shame of trying not to meet the neighbors’ eyes (they heard, they didn’t hear, they heard, they…) as, embarrassed at the incongruity, we got into the van to go to church, knowing what we would think if we had heard what they heard (oh please, didn’t hear!) and then saw them go to church.